ConservativeHome's ToryDiary: Why should the BBC have a monopoly on the licence fee? Why should the BBC have a monopoly on the licence fee? "Mr Cameron’s culture team has begun a policy review into public service broadcasting which is looking at ways to ensure Britain will have a “plurality of public service broadcasters” in the digital era. It will report early next year... Jeremy Hunt, the Shadow Culture Secretary, told The Times that in future the BBC might not be the sole recipient of the licence fee. “That’s one option because we want to make sure we aren’t exclusively dependent on the BBC for high quality television. “We want choice for consumers, and the BBC is not the only silo of good quality television.”"
Absolutely. It appears that Shadow Culture Secretary Jeremy Hunt is pursuing the issue I raised with him earlier this year (see second answer in this Q&A). 1. The TV licence fee - the poll tax on every TV-watching UK household that provides a means for high quality broadcasting to be produced. 2. The BBC - the organisation that currently consumes all of the licence fee. The same organisation that ConservativeHome believes is institutionally biased in a number of ways. The Tories wouldn't be politically sensible to recommend that a large proportion of the licence fee is taken away from the BBC but the Corporation would find it much harder to argue that a small proportion (say 2%) shouldn't be allocated to new public service programming - either on other channels or, ConservativeHome's preference, to fund a new public service broadcaster that is based on a different approach to news impartiality. What we need, as former BBC journalist Robin Aitken has proposed, is a new licence fee funded broadcaster that is based on the British system of getting to the truth' via having opposing arguments test one another. Our judicial system (defence and prosecution) and parliamentary system (opposition and government) is based on this adversarial principle. At the moment, the BBC is largely based on the French inquisitorial system whereby an expert searches for truth. The trouble is that the BBC expert is up to eleven times as likely to be liberal as conservative. That's why, in the last 24 hours, the BBC's coverage of the Bali summit has been disgraceful. There has been next to no attempt to give fair coverage to the Washington perspective. The Europeans have been presented as the good guys in wanting to address the issue (even though they're better at signing treaties than meeting their obligations under them) and the Americans are the bad guys (although Washington is investing hugely in clean technologies). 10% of the current licence fee funds the BBC's ten national radio stations. There's surely room for one-fifth of that money to go to a new current affairs radio station that is based on this adversarial approach to truth seeking? If you want to think of what it would look like, I'd point to the BBC's excellent Moral Maze as an example of what could be imaginatively replicated. The news, and more importantly the interpretation of that news, has suffered under the BBC. The British people are not getting a balanced and objective picture of events here at home or globally. The manipulation is subtle and only sharp-eyed people can spot it. I find ITN to be much fairer and more balanced. Anything the Conservative party can propose to enhance objectivity in broadcasting is to be welcomed. Some good points. The other issue is reporters interviewing other reporters with bizarre cozy takes on an issue. If its true that there is some political bias, what happens when the same people are interviewing each other! I don't care for the license fee, but the fact it all goes to the BBC doesn't especially concern me - what does, is the ammount of our money they waste on all sorts of rubbish. I have occasionally wondered about the possibility of privatising the BBC (or distributing its shares amongst its current owners- the British people- to do as they wish) whislt maintaining the air of independence and impartiality that the BBC likes to maintain with its news organisation. With that in mind, I thought about the possibility that the BBC could be split in two- one arm being commercial, deriving its income from advertising and commercial sales etc, the other being the news organisation. The two would both still be 'BBC' branded and oriented, however the news organisation would be guaranteed an income stream relative to its requirements and size from the larger commercial organisation, whilst retaining editorial independence maintained by the Chinese wall implemented between the two. If those of a 'public service' bent are intent on that minor role the BBC plays, then I would still be open to the idea that the BBC could have a public service remit as defined by a royal charter. Whether or not it will help to change the institutional outlook of the organisation is another issue entirely, but at least millions of people will no longer have to pay for the privilege of receiving basic information and entertainment. ITV News is shockingly bad, with its knee-jerk, Daily Mail-esque delivery and woeful manipulation of its audience, but at least I don't have to pay for it. Sky News is gradually getting worse (and unusually, I would have expected it to be as watered down in substance as ITV News by now- something it seems to have staved off- perhaps paradoxically because of the values transferred from ex-BBC staff? ), but again, I do not pay for it. Has anyone ever seen any news on Fox? I mostly just see a weather map and bites of news supplied by Sky News. The occasional rant from Bill 'Paris Business Review' O'Reilly interspersed. What sort of bonehead chooses Bill O'Reilly as a right-wing mouthpiece? I cannot understand this point as the BBC has the appearance of being against the Conservative party or if not at the very least pro liberal why would it not be politically sensible to either drastically reduce its funding and set up a well funded and more balanced service. Many of us do resent paying for a service which does not offer us anything like a balanced output. The answer to the BBC is to have all BBC TV broadcasts encrypted and payment of the licence fee would provide the user with a smart card to watch the broadcasts. Several people in previous CH threads have suggested this idea and it would be perfectly fair to implement it. Then the BBC would have its revenue determined by the demand for its service. Simple and fair. The BBC gave up public service broadcasting years ago. Why should we be forced to pay for reality television, game shows, soaps and minority sports like snooker? It is time to abolish the licence fee and the BBC. Let the market decide! Jeremy Hunt has steel in him. This is splendid news! TFA Tory, you make a very important point about the BBC failing in its remit as a public service broadcaster. How often do we see real quality broadcasting? A recent programme on BBC3 was 'Can fat teens hunt?' Why are we being forced to pay for this debasing rubbish? The BBC as a public service broadcaster should be bringing us things like live theatre, ballet, jazz, debates etc. Yet all we get is this trash with a one or two programmes of high culture thrown in every year. Its a complete waste of the public purse. The day BBC is either privatized or broken up the nation will give a collective sigh of relief. I will be as delighted as the next person when "Can fat teens hunt?" gets canned from the schedules... but the idea that the nation will "breathe a collective sigh of relief when the BBC is privatized or broken up" is pretty far-fetched and baseless. Look at the viewing figures when a national event is broadcast simultaneously on the BBC and commercial television. There is plenty that the BBC could and should do much better, but I am far from convinced that radical changes are either politically palatable or in the interests of the country. I think we should simply make the licence fee voluntary. That way, those who value the Beeb's output, be it "Can fat teens hunt?" or the left-liberal propaganda masquerading as news, could pay for it, and the rest of the population wouldn't have to. The Beeb should be given the freedom to limit who can receive its output if it wanted to. A friend of mine is high up in the BBC and he told me he raised the possibility in a recent drink with colleagues of modelling the corporation more on PBS in America, which has a much more restrictive remit, and canning the stupid soaps and so on. He said it was as if he had farted in church. The Licence fee should be scrapped and revenue obtained from advertising and sponsorship. The Licence "fee" is in fact a tax for watching television - ANY channel - because as things stand it is payable whether or not one ever watches any of the BBC channels! Pay per view throughout is of course another possibility although I fully accept that arrangements would have to be made for pensioners and other groups needing free access. I think it is excellent that Jeremy and his team are coming up with ideas and I look forward to seeing the results of their review in due course. Leave well alone until in Govt is my advice. We have enough trouble getting balance from the BBC. Threatening their empire would just make matters worse. The BBC as a public service broadcaster should be bringing us things like live theatre, ballet, jazz, debates etc. Yet all we get is this trash with a one or two programmes of high culture thrown in every year. Well, the BBC does bring us those things (as you'll see from their scheduling and after casting a careful eye over some of their remit-related documents), but I suspect that you're wanting to expand your theme of imposing your values on others in to broadcasting. The reason we get crap programming is because- whether you or I like it or not- the BBC is a public service broadcaster, funded by the licence payer and must demonstrate some sort of value for the money it receives- this means making low-brow programmes for the proles, Tony. If the BBC did not produce this accessible form of programming, it simply would not exist as a licence-funded broadcaster. At all. It would be unpalatable to allow the BBC not to serve the majority of those who pay for its existence (that is, the millions of viewers, listeners and readers measured for audience ratings). Paradoxically, it is this low-brow programming that allows your preferred style of programme(s) to exist and be broadcast by the BBC. Does any of this justify the continued existence of the BBC as a licence-funded broadcaster? Clearly, no. In Germany the equivalent of the licence fee is spread across several competing public broadcasters. They also derive income from advertising and programme sales. In Germany local cable and satellite broadcasters get payments for carriage of the TV signals to ensure access to viewers. There is no reason why the BBC could not be divided so that BBC 2, the digital channels, BBC news and BBC were separated. Part of the licence fee could also initially be provided to ITV and Channels 4 and 5 to subsidise them for a loss of income if the advertising market is spread wider. There is a high cost of regional radio stations and local TV channels. The local radio stations often crowd out commercial channels in parts of the country where there is only room for one broadcaster. There are obvious savings to be made here. The licence fee will be increasingly unsustainable as more viewers watch broadcasting on personal mobile devices and not fixed TV's. The old radio licence eventually failed, as more forms of portable radio made a fixed fee uncollectable. As I posted on the Question Time thread the way I see to curb the BBC is to offer choice, for we believe choice offers the consumer the best results in private business, choice is now considered the best solution to offer customers better service from the public sector, the one remaining area that hasn't been subject to choice is the public sector broadcaster. What needs to happen is that we either split the BBC in two, or incorporate channel four and split the combined channels in two. Then give people the choice which public service broadcaster they allocate their licence fee to. This would force a change on the culture of the BBC for they would have to respond to their customers, rather than being a closed off socialist politically correct preaching organisation, or lose them to the other public service broadcaster. By doing it this way would enable the Conservatives to mug the BBC, for hand on heart the Conservative MP’s could claim they support public service broadcasting, but the reality of this would be a means to set up a route to subscription broadcasting, along with free channels supported by advertising revenue. Iain - you cannot be serious. *Channel Four* to dilute the BBC's left-'liberal' bias? Have you never watched C4 news? On the other hand, why bother. You can just read the Grauniad on the way home and do something more interesting between 7 and 8pm. Very encouraging. Jeremy Hunt must be congratulated. The money must go to a new broadcaster though. If it ends up in Jon Snow's pockets it will be just as bad. "*Channel Four* to dilute the BBC's left-'liberal' bias? " Actually I find Channel 4 news a great deal less biased than the BBC's news, but that isn't my point, the change of culture I wish develop is achieved by putting the BBC and the alternative Public service broadcaster I want to from, in competition with each other for the licence fee. In doing that they would have to respond to their client audience ( or lose their licence fee), rather than as is now ignoring public opinion and preaching their politics to us. Those who say that the licence fee should be scrapped by politicians are being unrealistic (although it might be stealthily abolished by technological change). This is a sensible way of forming an alternative public service broadcaster and forcing the BBC to improve its act. It's a start - but vastly, vastly too timid. What is this whole thing about "public service broadcasting" that some people get hung up about? We don't have 'public service publishers' producing magazines/newspapers funded by a tax on reading, or 'public service bars' funded out of alcohol-taxes... the idea of a State broadcaster is just so hopelessly last-millennium. Scrap the licence-fee. Let the BBC become a subscription-service. "Those who say that the licence fee should be scrapped by politicians are being unrealistic.."
I think perhaps the way forward is the NuLab way. The obligation to pay the TV Tax should be the same as that to report party donations. Anyone caught not complying can say that technically they believed that they were not obliged to, but an internal inquiry means that the matter cannot be discussed just now. Besides, the Radio Times is always filled at times like this with correspondents claiming "...two guineas a microsecond for Jonathan Woss? Why, I'd happily remortgage the children and pay ten times that for the privilege of maintaining the BBC." Fine. Let them do so. Sally: just think of the campaign that the BBC would run against abolishing the licence fee? Tony Makara @ 23.11 yesterday - I haven't had time to read all the other comments yet, but wanted to say that I agree with everything that you have said, yes the bias is quite subtle at times and you do have to do a sort of lateral thinking, when watching, and many people would not know how to do that! Patsy Sergeant, yes, the bias is very well woven into the content. This was especially true during Gordon Brown's coronation. All the BBC comment was of 'The new government' 'A new start' 'New vision' 'New hope' etc. You would have thought it was the day after a general election. Bias works the other way too, we all remember the nasty way that 'Newsnight' personally attacked David Cameron with slurs about his 'Rich wife' and his Eton education. All the same old class-envy was there. BBC dramas very often play on the class-theme with wealthy characters playing the role of absolute swines while the working class characters are poor-but-honest. The BBC has done more to create class distinctions than any other medium. Its bias is appalling. What an excellent idea. However, losing 2% of their revenue isn't anything like enough to bring about the equivalent of regime change in Auntie Pravda. They need to be looking at the possibility of their licence fee revenues initially halving and ultimately disappearing completely unless they get their act in order. The BBC, as it has demonstrated in recent years, is currently incapable of delivering balanced programming. It needs to be threatened with oblivion unless it demonstrates that it can remember what public service broadcasting used to be. It's a start Mike... We should call it Operation Salami Slice! Staffer @ 10:32 - Oh yes I know there'd be a formidable campaign but I still think that's no reason for us to give in and simply accept the "status quo"! Reasonable proposals I suppose. BBC could also cut back some its empire. The part I find distasteful is all these howls from commentators for the BBC to be privatised. It would not be conservative to destroy a popular national institution and worldwide symbol of Britishness, especially for partisan gain. The last thing we need is more channels with annoying adverts. As an American who has lived in Britain for lengthy periods over many years, can I just say, reading this thread - you guys must be completely insane! To destroy a world-class organization because you don't agree with a few of its journalists is mind-bogglingly petty. Yeah, you are going to have a few liberals in there (seems that's now a term of abuse, just like in the States) but I see plenty of conservatism in there too. From where I'm standing, they seem to do a pretty good job of keeping balance politically. What you need to realize is that the BBC has produced some of the most fantastic programs ever made in the history of television precisely BECAUSE it isn't subject to commercial pressures. The "right to fail" enabled so many talented people to get projects off the ground who just wouldn't have been allowed to try to make it under commercial pressure. Don't take this crazy step in the hope of some mythical "impartial" news service. That just won't happen. You'll just end up with TV news like your newspapers - biased one way or the other, in the pockets of the parties. Is that what you want? You must be nuts. There would be absolutely no votes in aboloshing the BBC. Lets just have a look at some of the programmes they produce such as Planet Earth, one of the best filmed programmes ever. Deal with the bias in the BBC and Conservatives deal with their still pretty poor but slightly improved media deaprtment. All Conservatives think the media are liberal as does my own local party who won't even speak to the local paper. Wrong attitude they should be sending articles and letters to them every week but they don't they let the Local Lib dems do so instead. Deal with the Liberal bias don't throw the baby out with the bath water and abolish the BBC remmeber broadcating is not just about news it does also have to entertain hence the gameshows soaps and Snooker coverage. You don't like it just turn over. Apart from the Conservatives wanting to punish the BBC for their supposed Liberal bias what call is there for such a change? unless it is part of a plan for getting Murdoch's empire on side. Lots of people commenting here aren't addressing what Jeremy Hunt may be proposing. There is zero chance that the Conservatives will go into the next election proposing the abolition of the licence fee. There is a real chance that this "sharing of the licence fee" might happen. That's what we should welcome and support. Alongside the proposal to put all public sector jobs on to the internet that's an electorally saleable challenge to the current huge advantages enjoyed by Britain's liberal left media. I think most of us are very open to what Jeremy and his team may be proposing - and yes the word "may" is important here as I am quite sure they will be open-minded enough to consider ideas proposed here - including abolition of the Licence fee. Whether they eventually adopt those ideas is of course not known, but I have no doubt they will CONSIDER them. The BBC should be required to have some advertising, but even sharing the licence fee would be the end of public sector broadcasting. Fix the bits that are not working such as its biased reporting not the bits that are. The way to deal with political bias at the BBC is to Berlusconi it not abolish it. Not as a manifesto commitment or even publicly but, when we get back into office, stage a show down with the current Director General and the board over some particularly egregious bit of bias (blown up if necessary out of all proportion) and then appoint political (and of course Conservative)animals into the board and DG's office and give them a remit to purge the news editorial staff and kiss of death news readers eg Kirsty Wark in a specious re-organisation; promoting and appointing Conservative biased journalists, yes there are some but keeping their heads down, at every opportunity. No threat to the BBC. Indeed, buy off the popular high profile entertainers by increasing the licence fee with extra money for quality programming (i.e. fatter salaries for luvvies). "Why should we be forced to pay for reality television, game shows, soaps and minority sports like snooker? It is time to abolish the licence fee and the BBC. " That is exactly what I fear if we run a vendetta to abolish the BBC. You'll get more junk - more celebrity crap, more people who tawk lik this and it will actually be a massive further downward spiral into anti Tory decent British values. The BBC already advertise they seem to have a advert about themselves or about an upcoming programme at the end of each programme replace those with adverts and you could reduce the licence fee. I value the concept of the BBC but in reality rarely watch it because its 'entertainment' is generally poor and its current affairs is patently biased. To me the licence fee is extortion under another name. However, I agree we must have a public broadcasting service and the BBC is the obvious choice to continue leading the genre. However, what we need to do is to motivate the BBC to change its approach to 'neutrality' and improve its programming. Certainly the idea of creating a second public broadcaster is one way that this could be approached. However, would it truly address the current problems? It's not hard to imagine that a second public broadcaster could suffer the same problems as the BBC. Instead of a monopoly could we end up with a cartel? Consequently, would it not perhaps be better to actually relieve the BBC of a couple of its TV channels and associated funding (say BBC 3 & 4) and offer them under open competitive tendering franchise terms, say for a five or ten year period to the companies that offer the best programming schedule? You could further specify what type of content is provided. Say one is current affairs and the other mixed entertainment? No doubt the BBC would squeal somewhat but it's core services would remain in place and as such would likely not arouse significant concern in the country. By using the franchise option you go along way to avoiding the risk of creating another BBC. The same could be done with national radio. Potentially you could even use direct democracy in this to some extent (whether a company is good enough to keep the franchise). After all we all pay the TV Licence annually and therefore the cost of incorporating a short survey potentially could be quite low. However, I don't think we need to go that far just yet. If this franchise approach works and the BBC continue to sit on their laurels then perhaps then more stations and channels could be franchised? Of course all this effectively means that the programming and administrative functions (broadcasting and fee collection) would need to be separated from each other but with the current concerns regarding BBC programming this seems inevitable. I also favour John Redwood's suggestions that the BBC be strictly controlled as far as where they spend the licence fee. Taking the direct democracy concept further. We are already proposing that Police Chiefs are democratically elected. It seems to me in general terms the Director General of the BBC has a similar direct relationship with the public. So perhaps this role is a candidate to be elected as well? The licence fee is an idea who's time is done. In particular I hate the way students are treated. All too often, in their individual rooms they have poor, poor TV reception but are forced to buy a licence because they choose to have a television - largely to watch DVDs, and they are continuously harassed and subjected to checks. Students in Halls should not have to pay for licences. The BBC does frustrate me sometimes and there is a tendency to left-liberalness on some programmes but this has to be weighed against the complete drivel that some outright commercial TV can result in. I think our aim should be to encourage better quality programming that commercial stations might not be able to consider producing. To this end it would be better to spread the subsidy made on the licence to other channels. As it stand it is morally wrong to ask people to pay a licence (under threat of fines or worse) when some people don't even watch the BBC !! Anyway, I think that eventually this question of privatising the BBC will become rather academic... I rarely watch TV anymore- aside from rolling news on occasion- EVERYTHING I want to see is just downloaded. It's convenient and easy. Perhaps the older generation of viewers like being told what to watch and when to watch it, like cows to the cattle prod and voters to the ballot box, but I don't really know anybody under 30 who uses a schedule these days. It's dead. Perhaps we'll be looking at subscriptions to on-demand libraries in future for most of our recorded programming. Then when people realise how much they actually use the service, they'll realise the cost and value of it- positively or negatively. The BBC should be disbanded now. I think everyone would agree that their was a time for the BBC but to have one today is a joke. No one should be forced to fund the anti British, pro Islam, pro Eu BBC when we have so many commercial alternatives. If the mighty BBC is so good then it will do just fine under subscription although I think they'll find their not as loved as they think! Can I just point out to those who say their aren't any votes in abolishing the BBC TV Licence that every poll in this country bah one shows a clear 75% want an end to it. The poll which shown we didn't want to scrap it was carried out by The Work Foundation (Goverment & BBC use them) and the head of that just happens to be a former BBC employee !. I'll also point out most of the people they asked were oap's who get the BBC TV Licence for free thanks to the taxpayer. What poll said the BBC should be abolished? Tell the millions that watched come dancing or match of the Day or planet earth or wimbledon or BBC news or still listen to radio 1 or 2 or 3 or the world service that we are going to abolish it. Yeah viewing figures may be reducung but they actualy are still in the millions, not the thousands of the Living channel or the History channel. You abolish the BBC and you will take all these programmes away from people. English cricket for example I was born and bred near Lords now I never see the cricket becuase its on sky only, in a few years Bangladesh will take over from England becuase no one will be playing it. I should add that, much as I am strongly for privatising the domestic services, I still believe that there is an important case for retaining the World Service and not only that, but perhaps expanding its services. With an increase in global audiences, the Service's importance to those who rely on it has been underlined. You miss the obvious point. If you want to watch the cricket - as I do - then give Sky some money to get that channel. If you want to watch Wimbledon then give the BBC some money to get that channel. Or Sky, or Eurosport or whoever bought the rights for that year. The current difference is with all of the other channels I have that option. I've never watched Strictly Come Dancing in my life but I'd get arrested if I didn't pay the BBC/Government for the right not to watch it. "I still believe that there is an important case for retaining the World Service and not only that"
This will be the same BBC World Service what Israel decided to get rid of while replacing it with Al jazeera because they though it less bias! "What poll said the BBC should be abolished? Tell the millions that watched come dancing or match of the Day or planet earth or wimbledon or BBC news or still listen to radio 1 or 2 or 3"
People what it now because 1 they have the lower channel numbers and 2 they're forced to fund the dinosaur. Its simple surely? Those that enjoy and want BBC output, should pay for it themselves. Those who don't, shouldn't be forced to. The trouble is those who like its output want the rest of us to help them pay for it. This has to stop. What annoys me is not the fact that I think it is biased, but that I am forced to pay to help it to be biased. Scrapping the licence fee is not privatisation - it should be a Conservative priority! Would David Cameron identify as Liberal or Conservative on Facebook? Keep the BBC License Fee. The BBC is a natural conservative institution. It is British. It exists by Royal Charter. The BBC World Serice is an important ingredient in the UK's international prestige. And Radio 4 is certainly v. good. Talking of the BBC License Fee we the Conservative Party should really be attacking the decision of the Labour Governmnet to axe the role of post offices in processing the fee, thus rendering those (gain) naturally conservative institutions unviable. Which commerical channel that you don't have to pay for has match of the day or Wimbledon and which commercial channel has ever put on any programme as good as Planet earth? Abosolutely none zero zilch. I've suggested a compromise have some advertising at the end of programmes to reduce the reliance on the licence fee. Totally abolishing it would reduce qualitly as my point above says. Also do something about the in-built Liberal bias, but just because don't like an Political interviewer don't abolish the BBC, I've complained about the same thing on ITV before. If you do abolish the BBC or the licence fee you will only have yourselves to blame! One Marcus, I don't think anyone is seriously suggesting sacking everyone at the BBC and putting a "Property For Sale" sign at the front gate. You are still missing the point. It is also disingenuous to include Wimbledon in your examples as I believe that it is one of the 'ring-fenced' sports which can't be exposed to bidding. The Olympics and World Cup/Euro Championship Finals are similarly protected from competitive bidding by Sky etc. The major providers of televised sports are ITV (football, F1) and Sky (football, golf, rugby, cricket). These channels are subject to market forces and respond to public demand. If people don't watch then there is no advertising revenue so ITV and Sky show the sports which people want. Why shouldn't the BBC should be the same on a commercially level playing field? Remember that it was the BBC who cancelled MoTD and Grandstand - only to replace them with Graham Norton. "Which commerical channel that you don't have to pay for has match of the day or Wimbledon"
Well it the mighty BBC didn't abuse it's position by offering huge amounts to show those events they would be on one of the commercial channels. You seem to have missed the point in that we're told the BBC is a public Service and so shouldn't be in competition with other stations ! Now could you please tell me what the BBC public service content is ? The BBC is a corporation owned by the people, the population, who buy shares in it (involuntarily). As shareholders they should be fairly represented by the people who manage their business. At annual general meetings they should have their say and be able to sack those who are not producing the quality of service required. I think the BBC should lose some of its Liscence Fees because it has become a biased institution for Labour, it has lost its neutrality.I do not agree my liscence fee should be used to fund an organisation that sees its duty and responsibility as that of defending the Labour Party. Perhaps, if they were made to seek alternative funding in the real world, they would be a lot more balanced in their reporting. So some bright one thinks we should share the T.V. licence fee among other broadcasters. This will be the forerunner of ever increasing charges for watching the box. BBC should use advertising revenue to fund the whole of it's operation. The BBC should be privatised; scrap the fee and let them swim or sink in the commercial world. Lets not in government get into this whole privatise and make it better arguement. What's better on the Commercial channels not one person has answered this question and yes the BBC does have to compete for viewers. Look at present viewing on the BBC we have Oliver Twist a new major 5 part adaptation of the Charles Dickens classic on ITV we have Trinny and Susannah undress the Nation. Public service broadcasting on one lowest common denominator on the other. I never said continue with the licence fee as it is, I said reduce the amount of funding from the licence fee by making them have take some advertising at the end of programmes. One marcus said "Lets not in government get into this whole privatise and make it better arguement"
You don't come across as a Tory One marcus but a secret NuLaber person. I never watch the mighty BBC and here's some of the shows I do like on the other FREE stations you are not forced to subscribe too. So you see One marcus if you think the BBC is so great people like YOU should be forced to fund it instead of expecting millions of others to subsidise your viewing habits. Ome marcus misses the main point on the BBC. It is nothing to do with the quality or style of programmes or comparing other stations: the BBC is no longer a public broadcasting service, it is a tool of the government; it distorts news and information. If other channels distort the facts on information, we have a choice, and it do'nt cost us anything, because they are commercial channels; we are compelled by law to pay for the BBC; that is wrong; scrap the BBC licence fees and let them compete in the commercial world. I complianed about the summing up by ITN's Tom Bradbury in which he said prior to Cameron's conference speech I don't think the Tories have any chance of forming the next Government. (Incidentially I never have got a reply). The BBC is biased Sky News is biased, (well it was when I could get it I've got Virgin so it was taken away)but I'm not talking about taking away their funding or aboilishing them. Good idea having independent audits of the BBC though Sao Paulo. My preferred news service (TV anyway) is Skynews and I've yet to see anything biased so could you help me out One marcus ? Any coverage on any of its many outlets, by the BBC of the protest in the European Parliament last week? Not on you nelly! If there were stewards being sent to wrestle placards off people in USA it would have headed the news, but, no, not any coverage that might damage EU. 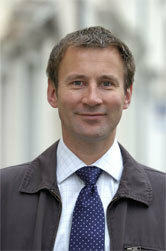 And Jeremy Hunt is hot! This may have been mentioned already, but but I've always thought there should be something to regulate the BBC and to force it to give a balanced view. The fact the the opinion polls show the Torys with a large lead, and nearly all of those voters are being forced to fund a left wing organisation like the BBC seems little short of criminal. I use the BBC "Have Your Say" service often and I have found that my posts are sometimes rejected despite having nothing in them to break house rules. The only possible reason for rejecting them is that someone at the BBC doesn't agree with the comment. When a labour minister does something wrong, it is brushed over on News 24, but a lesser offence by a Tory MP becomes a week long drama. Often the BBC ignores facts that are unfavourable to the left and instead uses language amounting to political spin. The problem exists throughout the whole of the BBC and it has to stop. I have no problem with there being a licence fee, but the BBC should only get the money if it remains neutral. You could kick them into shape by removing 1% of the money from the fee for each year that it remains bias. Even with the BBC's disgraceful behaviour, the Tories are still ahead in the opinion polls.. Imagine how much farther ahead we'd be if the media told the truth!! Someone mentioned that the left wing bias was subtle, but that is clearly not the case. Certainly the famous remark on the radio on the Today programme when one of the presenters said "when we get back in again after the election", was a clear indication of bias. But the BBC continue to recruit from ultra left universities, so to some extent it is ineviatable, but what really irks is the fawning questioning of ministers in this government. I agree with many other comments and in particular the gentleman from the USA, but I would not have the BBC paid through advertising; no adverts has to be the best part of the BBC. The BBC have really annoyed me today. Not only do they clearly support socialism, but they clearly support communist China too. Their reporting of the situation in Tibet is outrageous. In none of their articles on the website does it mention any factual background to the Tibetan's case. It doesn't mention that the Chinese have killed at least 1 million Tibetans since 1950, or the 6000 monasteries destroyed, or the 7.5 million Han Chinese imported by the governmnet (thats 1.5 million more Han than Tibetans now in Tibet), it doesn't mention China trying to take control of religious matters. The reincarnation of the Panchen Lama, was decided by the Dali Lama, then the Chinese took the boy away and he's not been seen in public since. The Chinese then said they've chosen the next Panchen Lama, a Chinese puppet. The Panchen Lama is important in finding the reincarnation of the Dali Lama. When the Dali Lama dies, China will seek to impose a puppet Dali Lama too. The fact is the BBC has not mentioned any of these things and has only used the Language as quoted from the Chinese government. The BBC said there was a bloody uprising in Tibet in 1959, but it didn't say the reason in was so bloody was because the Chinese massacred the Tibetans. The BBC is shameful, not only is it now a platform for our socialist dictators, but it has clearly now become a platform for other's communist dictators, eg Castro. I suspect the BBC plans to ignore the truth and facts, in favour of staying in with the Chinese government as best it can. And we have to pay for them to act this way?!?! Every single public opinion poll has shown a clearly majority want an end to the BBC TV Licence. It's clear however that the Lib-Lab-Con (a minority) wish to force an entire country into funding their Biased Broadcasting Corporation which shows how selfish and arrogant these people are.